Over the weekend, Ben Casselman’s New York Times article took the economics profession by storm. That may be an understatement too. The reason is that Ben was able to put a face to, and give real examples of how employers are responding to a tight labor market. Specifically, he highlights a Wisconsin company that hires inmates at market wages ($14/hr). The inmates actually get to keep this money too, or it accumulates in an account until they are released. This story comes on the heels of another one late last year that highlighted a company that employs recovering drug addicts as a way to fill out their workforce. The company even holds, or allows for counseling meetings to take place at the work site in an effort to help their workers stay clean, and thus productive workers as well. Ben’s article also quotes Larry Summers, a Harvard economist and former Treasury secretary, as saying “When the unemployment rate is lower, employers will adapt to people rather than asking people to adapt to them.” As our office has said in recent years, a tight market means businesses much dig deeper into the resume stack to fill positions. They need to pay more to attract and retain workers. And firms are much more likely to hire individuals with an incomplete skill set, or a gap on their resume. On-the-job training becomes considerably more important in a strong economy. All of this is true, and I think helped set the stage for the popularity of the New York Times piece. It was a nicely researched, and well-written article that was able to put a face to the economic theory and data. Additionally, these are the types of wild anecdotes that only happen in a strong economy. A tight labor market works wonders. Now, it doesn’t cure all ills. Employing a wider swath of the population, including those with less experience, fewer skills or those previously discriminated against is just a start, but it is a start nonetheless. One of the biggest problems in the past 18 years is the fact that the economy has not been at or, quite frankly, even near full employment for the vast majority of that time. One piece of research Ben uses in his NYT article to prove his point is looking at the share of the population with a job broken down by educational attainment. Across the U.S. in the recent years, employment rates have risen the fastest among those with less formal schooling. The expansion has clearly spread to all groups. The same is true here in Oregon, as seen in this edition of the Graph of the Week. 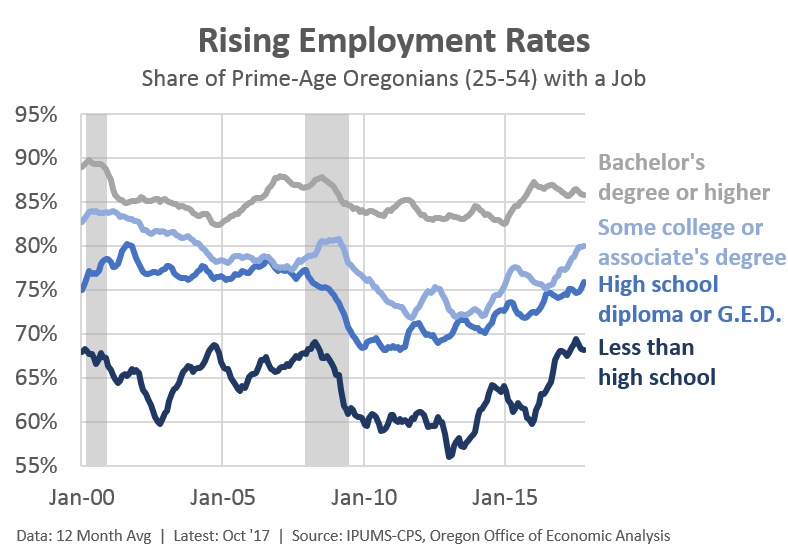 As noted previously, the share of prime-age Oregonians with a job is back to where it was a decade ago. However, and somewhat surprisingly, this is true for essentially all levels of educational attainment. Tight labor markets and a strong economy do wonderful things. There is a reason the Federal Reserve has a dual mandate. It’s not just price stability, but price stability and maximum employment. Finally, due to the article and the response among the economics profession, Bloomberg columnist Conor Sen asked what the next group to see stronger employment rates would be. Tomorrow, I take a stab at answering him. The unemployment rate has fallen to historic lows, creating an opportunity for previously unemployed or underemployed workers, with positive effects on the labor participation rate. However, wage growth continues to plod along, seemingly unaffected by GDP growth and unemployment. In your follow on article, any comments on wage growth would be appreciated. Thanks Scott. Here is a link to a previous look at Oregon wages. While it is true that US wages have slowed slowly picked over in recent years, now up to around 2.5% y/y where it has stayed for most of 2017, Oregon has seen better wage growth than the U.S. Oregon wage gains are seen in all industries and in all regions of the state too. It’s not gangbusters, but it’s better than the U.S. Oregon’s numbers slowed in 2017 compared with what this post from a year ago showed, but they’ve still been better than the U.S. in recent years. You can also see here, that Oregon’s average wage – while lower than the US average – is not now at its highest relative point since the mills closed in the 1980s. Keep in mind that the option of hiring prison inmates (or ex-offenders) is not necessarily available to all employers, such as law enforcement. In particular, 911 call centers continually struggle to avoid chronic under-staffing, and I am sure the current low unemployment rate only worsens that situation. A significant share of applicants already fail to pass required background checks, and any “relaxing” of application standards will only make matters worse yet. Historically, call-taker positions have been (mis-)categorized as “clerical” in nature, which has made it difficult for those agencies to offer salaries attractive enough to overcome the inherent downsides of high stress and the need to cover 24/7 shifts. This ongoing nationwide crisis is made even more urgent by the current migration to a “next-gen” emergency call-taking system, which will unleash a flood of incoming text messages, photos, videos, and other non-voice communications, while the old landline-based funding models are also in dire need of reformulation.